It was not long ago when women gained the right to vote in this country. It took 72 years for the suffragettes to convince congress to grant voting rights to women across the nation. Organizations rallied, protested and stood up for the rights of women in order to give voice to the issues they faced. The newly released movie Suffragette makes this topic relevant and inspires women to stand up to the barriers we face today. Suffragette tells the story of the Women’s Social and Political Union in the UK led by Emmeline Pankhurst. Their violent tactics let to the brutality of female activists until they finally received the right to vote with the Representation of the People Act of 1938. In the U.S. 1848 marks the beginning of the women rights movement with the first gathering held in Seneca Falls, New York. Elizabeth Cady Stanton and Lucretia Mott led 100 people to stand together and say “All men and women are created equal.” Although their stance was addressing many issues, it wasn’t until Stanton and Susan B. Anthony met in 1850 that would change the course of this historical movement. Despite the indifferences, the two groups found that being divided would stall their progress and in 1890 unified to form the National American Woman Suffragettes Association (NAWSA). This collaborated group attracted more women and focused it’s efforts in gaining the right to vote state by state. Through trial and tribulation, the first state to grant complete voting rights was in 1869 in Wyoming. Slowly after, states like Colorado, Utah, and Idaho jumped on board. It was from 1910 to 1914 that women began to see a surge in women’s voting rights in more states. The success was progressing, however, some activists like Alice Paul wanted more action to be made. Her confrontational rallies and marches attracted younger feminists who wanted rights on a federal level. 1917 marked the year of some remarkable improvements in the feminist movement. More states were granting voting rights, and according to the History of the House, “President Wilson urged Congress to pass a voting rights amendment.” Yet, most importantly Jeannette Rankin was elected as the first woman to serve as a member of Congress in the House of Representatives. Congress has improved representation and we are seeing a women who may possibly become president in 2016. 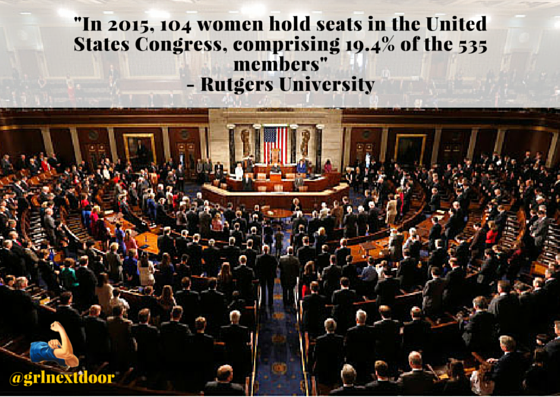 However, according to Rutgers University “In 2015, 104 women hold seats in the United States Congress, compromising 19.4% of the 535 members.” Therefore, there is still room for diversity in politics. In the midst of the first world war, women were more involved in the workforce and Congress understood their participation was vital to a safe government. There was much debate and the amendment passed through the House and Senate. Finally, Congress ratified the 19th Amendment on August 26th, 1920 giving full voting rights to women across the nation. Although we have the right to vote, women still face some of the same challenges as those back in 1848. Natalie Patterson a poet who focuses her work on inspiring women says, “if you work hard, ask for a raise find your backbone and attach it to your standards, you deserve the money that correlates to how hard you work.” Her words express the barriers women face today with issues involving education, economic opportunities, and political representation which were all addressed in the first gathering at Seneca Falls. Previous Foreign doctors’ path to re-license in U.S. far fetched?